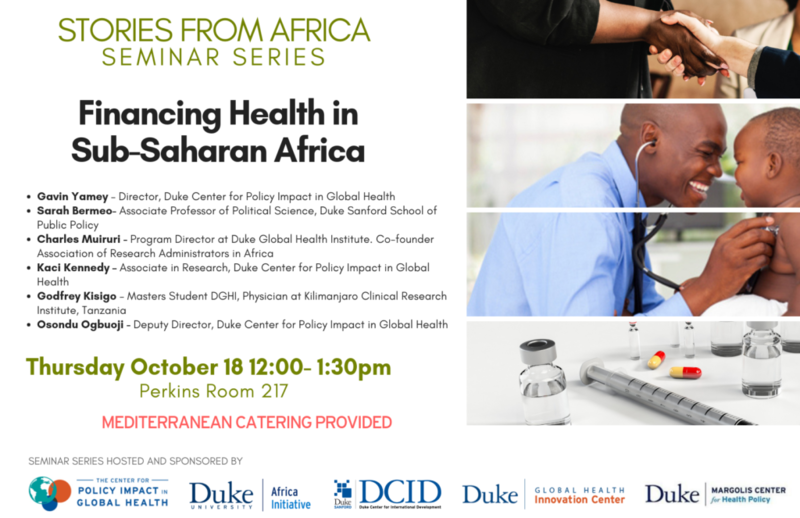 Our center received a grant from the Duke Africa Initiative to establish a cross-cutting seminar series jointly organized by four centers at Duke University: The Center for Policy Impact in Global Health (CPIGH), Duke Center for International Development (DCID), Duke-Margolis Center for Health Policy, and the Duke Global Health Innovations Center (GHIC). These seminars will focus on health and economic development issues in Africa. What are the key challenges for financing health in Sub-Saharan Africa? Who are the major global health actors and how will donor resources be best used as African countries begin to finance more of their own health needs with domestic resources? How does China’s Belt and Road Initiative fit into the global health landscape in Africa? Gain key insights at the discussion on Thursday, 18th of October @Perkins, Room 217.